With millimetre precision, certain tumours can be irradiated at the Paul Scherrer Institute PSI using protons - that is, positively charged elementary particles. PSI is the one place in Switzerland where this especially protective and precise option for radiation therapy is possible. More than 8,000 patients have already been irradiated successfully. 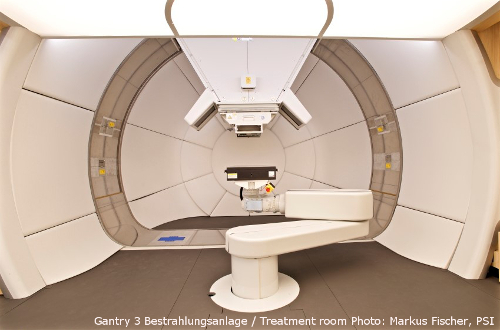 Now, a new state-of-the art treatment facility, the so-called Gantry 3, has been put into operation. The first patient treated at Gantry 3 is a 40-year old Swiss woman diagnosed with a brain tumor. The treatment session went smoothly and safely. Further 29 sessions follow to successfully complete the whole treatment.